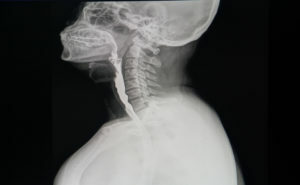 What is Dysphagia (difficulty swallowing)? HomeConditions & Symptoms FAQWhat is Dysphagia (difficulty swallowing)? Dysphagia refers to difficulty with swallowing. Swallowing seems like a simple, automatic process, but in reality, it takes the perfect coordination and participation of nerves, muscles and brain signals to happen successfully, directing food down to your esophagus without causing you to choke. Dysphagia can be caused by a problem with any of these participants in the swallowing process, but it’s often a symptom of GERD (gastroesophageal reflux disease) or LPR (laryngopharyngeal reflux).